By Molly Parker, Molly.Parker@StarNewsOnline.com, Published: Saturday, September 21, 2013 at 10:00 p.m. They want the option legal in this state to try medical marijuana. They want it so they aren’t forced to uproot and move to another state where it’s legal, where there’s been early success in treating seizure disorders. For children, the cannabis is taken orally and not smoked. In North Carolina, these parents are at the forefront of what could become a divisive, emotional debate in the General Assembly – if it ever gets that far. They are a relatively small group, connected by a Facebook page. Some parents opted not to be interviewed for this story because of the controversy that exists around medical marijuana. But three families chose to speak out. These are their stories. She’s from New Jersey; he’s from New York. But as fate would have it, Annetta and Matt Saggese met in San Diego, where both had applied to teach at a charter school. After some time out west, the two decided they wanted to come back east, but not to their former homes. So they settled on Wilmington. “This is the San Diego of the East Coast if you ask us,” he said. They are both teachers here now, Annetta at a small private school and Matt at a public alternative school. Just over four years ago, they welcomed home a beautiful baby girl named Annetta, like her mom, but affectionately called Netta. The problem went away for a brief while but then returned. “About a week later I started recognizing when she was breast-feeding she was having episodes. It was clear it was not normal,” Annetta said. They took their baby to the pediatrician, and seizures were confirmed. Netta was placed in an ambulance, and the family followed to Chapel Hill for a rigorous bout of testing, including lumbar punctures, MRIs and a full body skeletal X-ray. “It was the biggest shock to our world to get in the car and chase the ambulance,” Matt said. 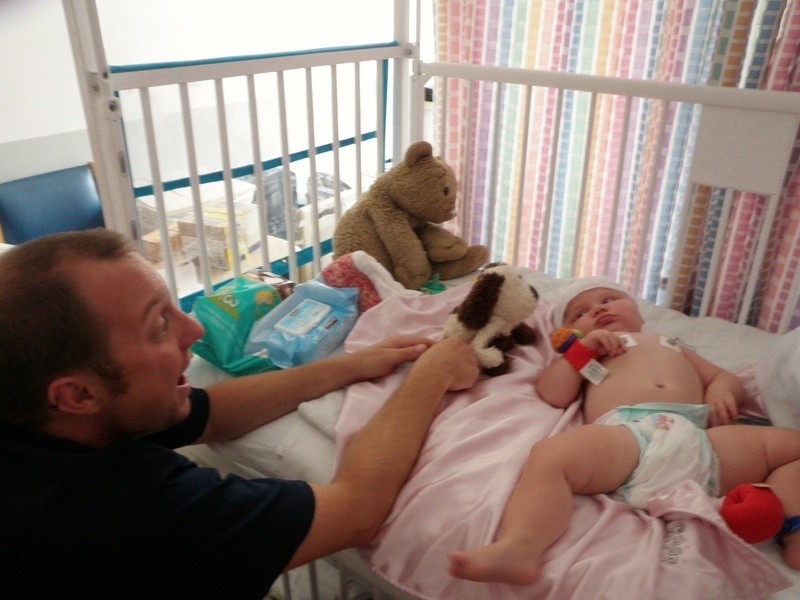 That was October 2009, they recalled, on Halloween – Netta’s first Halloween in the hospital. “But not her last Halloween in the hospital,” her mom said. She’s been on a cocktail of medications, some that have worked, some that haven’t. All have had drastic side effects. One prevented her from sweating. She was placed on a soy-based diet only to find she had a severe allergic reaction to soy. A drug she’s on now warns of peripheral vision loss. “If we’ve considered giving her medicine that could make her blind,” Matt said, “or removing part of her brain,” Annetta added, then why not try medicinal marijuana, they’ve concluded. A big part of the “why not” is it’s not legal in North Carolina, even though it’s been used with limited success treating other children with conditions similar to Netta’s in other states. While some parents proclaim they’ll up and move if they have to, the Saggeses say it’s not that simple. They have day care here through Easter Seals where therapists are trained to teach Netta. They have friends and a support system and jobs. It’s not so easy to uproot, especially with a disabled child. They don’t think they should have to anyway. was grape juice, and the government said, ‘No, you can’t give that child grape juice because you can use it to make wine,’ they are two totally different things. So with the high CBD, low to virtually no THC, it’s like grape juice,” Matt said. Tetrahydrocannabinol, or THC, is the component of marijuana that’s psychoactive, while cannabidiol, or CBD, has been shown to have medical qualities. “Anybody that would take it to get high, it would be a waste of time,” he said. This year, Netta has made some big gains, she said, and for that they are thankful. Because they don’t know the prognosis of their child’s illness, they take each day as it comes. Matt held his daughter on the floor as Netta sucked from a juice box. A little later, she giggled as he tickled her. Liz Gorman, of North Raleigh, is a stay-at-home mom, the owner of a large, well-decorated home in an affluent neighborhood, and from a family with political ties. Gorman freely admits she’s an unlikely candidate to be at the forefront of the medical marijuana debate. “I’m a Republican. … I’m a conservative person politically,” she said. She’ll move to Colorado – where it’s legal – if she has to, and leave her husband here. But she’s hopeful that lawmakers will hear this story – and will hear the pleas of parents like her – and make medical marijuana use legal in North Carolina, at least for children. Their daughter, Madeline, is 6 years old, but because of catastrophic epilepsy she functions at about 1½ years old. She has trouble walking and talking. She recently had brain surgery, which helped slow her seizures. Before that, she would have about 300 to 400 a day, Gorman said, or seven to eight seizure “clusters” lasting up to 40 minutes each. The so-called large tonic seizures were the worst. Madeline would stop breathing, make a horrible shrieking noise, lose control of her bowels, and then become atonic, or “out of it,” for three to four minutes with her eyes fixed upward and her little body limp. That was happening three to five times a day before a recent risky brain surgery. The surgery wasn’t expected to cure Madeline of her seizures, just make them less violent – she was slamming into the floor – but it has granted something of a reprieve. Still, Gorman expects them to return. And if they do, she’s prepared to uproot her life. “I would run to Colorado right now if the surgery we just did hadn’t been as successful as it has,” she said. Her daughter, whom she calls Maddie, has tried a string of seizure drugs and regimens: Keppra, Prednisolone, Vigabatrin, Topomax, Zonegran, Lamictal, Vimpat, ACTH, Clonazepam, the Ketogenic Diet, and IVIG. Madeline was diagnosed with leukemia at 11 months old. Chemotherapy rid her daughter of cancer, Gorman said, but may have been the root cause of a lifetime of seizures. The advocate in Gorman is poised – and pointed with her words. She ticks off studies showing that public opinion has warmed to the legalization of medical marijuana in North Carolina. But the mother in her wiped tears from her eyes as she explained that even the horror of watching her baby battle cancer pales in comparison to the epilepsy. “Cancer was really awful,” she said. “But the epilepsy is a much more difficult battle to watch. My daughter was bright and was speaking normally and this amazing, curious being. And she lost all of that,” she said. When it’s said that medical marijuana for children is risky, with unknown side effects, Beth Elliott points out all the side effects of traditional treatments that have taken a lifetime’s toll on her little boy’s body. Her 5-year-old son, Gage, as a result of his numerous anti-seizure medications, has suffered kidney stones six times, urinary retention, insomnia, severe lethargy, rashes, heart palpitations, enlarged heart, loss of appetite leading to a feeding tube, nonstop crying, liver issues, urinary tract infections, inability to sweat, high blood pressure and many other problems. Gage, who lives with his family in Roper, a small town in the northeastern part of the state, had his first seizure at 6 months old and has been having them every day since then. The family has tried countless medications and a special diet to try to help control his seizures. Gage at 1 year old. “Nothing has helped,” his mom said. She hopes marijuana is the answer – and wants it legal in North Carolina. “Something that has shown and proven medical benefits with use and something that has changed the lives of so many for the better is not available to my son because of the state we live in,” she said via email. Elliott said her son has maxed out on the medications that he is now on and options for medicine he hasn’t tried are limited. She has researched “day in and day out,” scouring the Internet and Facebook groups for a new treatment that could not only control the seizures but also keep him from his oft-comatose state and give him his appetite back. “I found the answer to what I had been looking for when I came across an article about CBD,” she said. But she discovered that though some in the country have access to the relatively new treatment, her son cannot because of state law. “That infuriates me!! !” she wrote. “We will do anything to give Gage the opportunity to try CBD, and I am more than happy to share our story to help educate others on this subject,” she said. On Twitter: @StarNewsMolly | Copyright © 2014 StarNewsOnline.com — All rights reserved.